Two piece modular falls mat, designed to protect individuals against injuries which can occur when rolling/falling out of bed. Over the last few years there has been some well-publicised controversy surrounding the ongoing use of bed rails in hospitals and care homes. Bed rails (also known as cot-sides, safety sides and bed guards) are widely used to protect vulnerable patients/residents from rolling/falling out of bed, but this method can pose many dangers for potential injury to the service user. The most serious danger being entrapment between the mattress/bed and the rails, by the head, neck or chest - which can lead to death by asphyxiation or cardiac arrest. Injuries can also arise from limbs becoming trapped or from the service user attempting to climb over the rails and falling. Since this problem has been highlighted and brought to the top of the agenda in care facilities, many organisations are looking for alternative solutions to protecting individuals who are prone to falling out of bed. 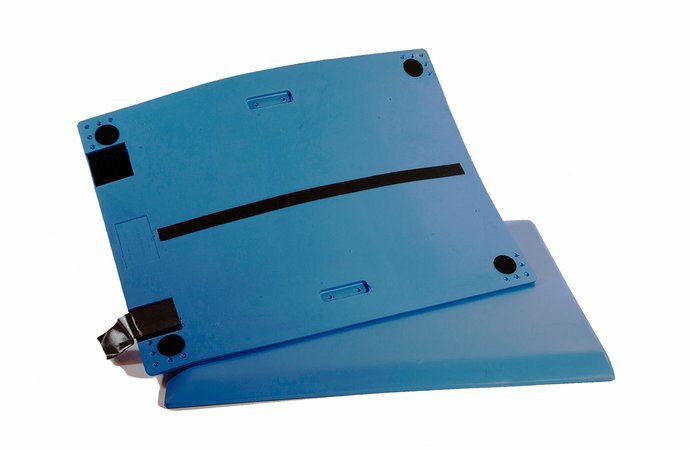 Hospital Aids is one company who has worked closely with NHS staff to develop a two piece floor mat designed to help protect vulnerable patients from the risk of serious injury when rolling/falling out of their beds - The Modular Falls Mat. The Modular Falls mat - commissioned by NHS Innovations, is ideal for use in care homes, hospitals and other care facilities in conjunction with low profile beds and in recreational areas for those prone to falling from their chair or fitting. 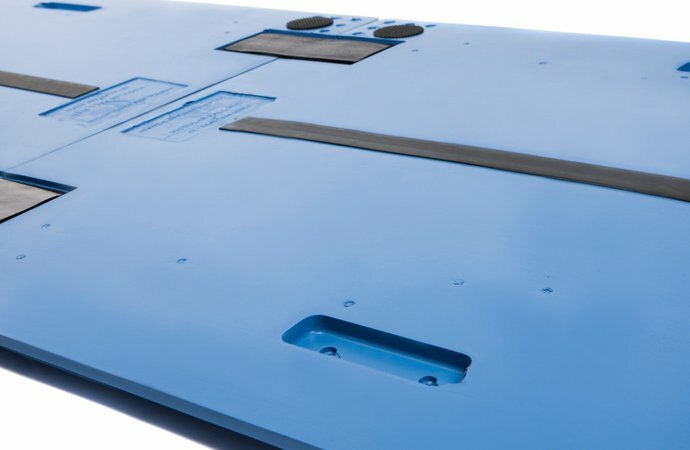 The Modular Falls Mats are produced using a high density polyurethane foam, which has been specially designed to absorb and redirect the impact forces of a fall. The Mats react instantly at the moment of impact. As deceleration begins, the high density core works to dispense the downward force away from the point of impact and distribute it along the whole area of the mat, this prevents the sudden reversal of energy and bottoming out against the floor - thus lessening the impact. Each Mat is manufactured in two sections which can easily be joined together with large hook and loop velcro connectors and each section can easily be carried to the required area using one of the indented handles which are located on the underside of the mat. To help minimise the risk of staff and visitors tripping over the Mats each section has tapered edges, which also allows chairs, commodes, IV stands etc. to roll over it (please refer to safety instructions). Unlike tri-fold soft foam mats, the Modular Falls Mat has no seams to trap dirt, wear, become a tripping hazard and eventually begin to split apart. For further information on using the Modular Falls Mat please refer to the user guide. It is advised that all furniture and other objects are cleared from where the individual may fall and are kept off the Modular Falls Mats - to reduce the risk of injury to the user and to ensure that no damage occurs to the upper surface of the mat. While the individual is in bed, ensure that the bed is set to its lowest position. If the bed/chair has brakes on its castors/wheels ensure these are locked on to prevent the bed/chair from moving away from the mat. The tapered edges of the Modular Falls Mat reduce the possibility of trips. If placing a wheelchair/mobile shower chair/commode on the Modular Falls Mat, ensure that the wheels are placed centrally to the mat before moving over the sloping edges to avoid the possibility of tipping. Do not attempt to carry more than one Modular Falls Mat unit in each hand. The Modular Falls Mat is impregnated with TETRAMASS PLUS antimicrobial additive, which enables easy cleaning. Tetramass PLUS additive is supported by HSE, BPD, EPA and FDA approval. It also has many worldwide regulatory approvals and is listed on the following inventories - EINECS (European Union), TSCA (USA), ACOIN/AICS (Australia), ENCS (Japan) and DSL (Canada) Korean Inventory. To reduce cross-infection it is recommended that the mats are regularly washed using a soft cloth and warm water containing a mild detergent (no oxidizing cleaners or harsh chemicals) then dried with a clean soft cloth/paper towel. The mats must not be left immersed in water/fluids nor left sitting in wet/fluid conditions. In situations where the above cleaning procedure is not practical, specialist TETRAMASS PLUS antimicrobial wipes are available from Tetramass Ltd, 01604 781880, email info@tetramass.co.uk. Modular Falls Mats should be checked regularly for marks and to ensure that the Velcro fasteners are in good condition. Avoid placing hot objects or furniture with sharp feet and other sharp objects on the Modular Falls Mat as this may cause damage to the upper surface of the mat. The Modular Falls Mat been safely tested by SATRA to a falls height of 1,000 mm (test method Clause 6.15 in BS EN 1728: 2000). 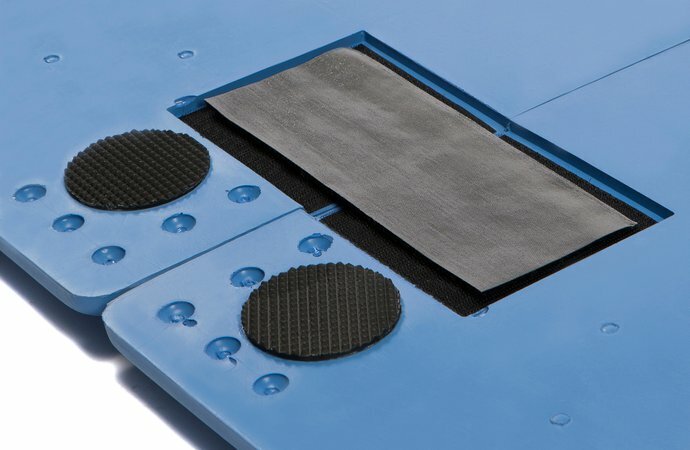 The Modular Falls Mat has also passed the appropriate tests for slip assessment (pendulum testers BS7976-2: 2002 and surface roughness measurements) and small source of ignition (determination of the effects of a small source of ignition on textile floor coverings BS 4790: 1987). CE Marked and registered with the Medicines & Healthcare products Regulatory Agency (MHRA). Are Modular Falls Mats just for use next to beds? 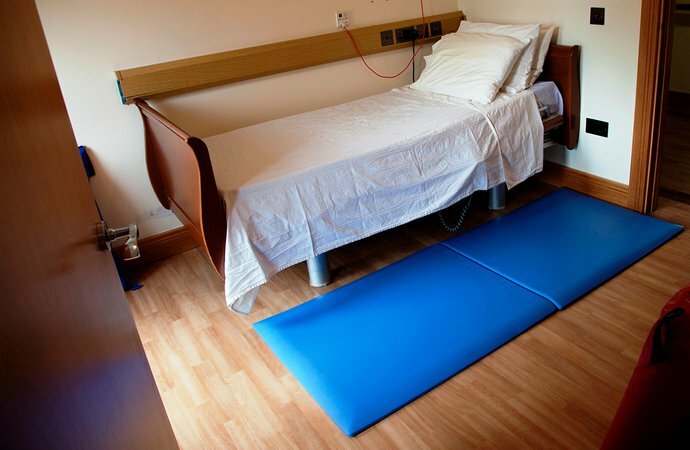 Modular Falls Mats are suitable to protect individuals from injuries when falling from both beds and chairs and can be use in bedrooms, recreational areas, sensory rooms and play areas. Can the Modular Falls Mat be cleaned? Yes. See cleaning and care for information. Are Modular Falls Mats 100% effective at protecting against bed fall injuries? 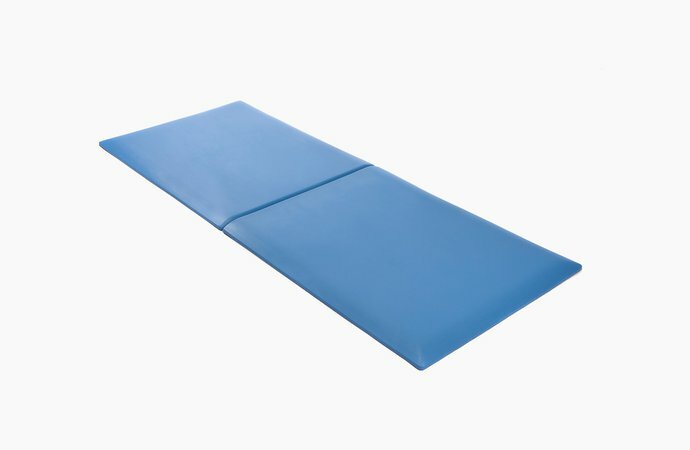 While Modular Falls mats help to minimise the risk and severity of injury to the user should they fall, no product can claim to be 100% effective all of the time due to factors such as, the manner in which the user may fall, underlying medical conditions such as brittle bones and the way the mats are placed. Therefore Hospital Aids makes no guarantee that a person using the Modular Falls Mat will not sustain injuries. Can bed rails still be used with Modular Falls Mats? It is recommended that bed rails are completely removed rather than just lowered, if using falls mats for injury prevention. Failing to remove the bed rails poses the danger of the user hurting themselves against the rail and the possibility of injury due to entrapment - which could lead to broken limbs should they fall while trapped.